US Customs and Border Protection (CBP) officers say they seized a shipment of counterfeit toys with a Manufacturer’s Suggested Retail Price (MSRP) of more than $9,000 in Tampa, Florida. The counterfeit LEGO toys arrived at the Port of Tampa in a shipment from China on June 18. CBP officers selected the shipment for inspection and immediately noticed that the merchandise was substantially indistinguishable from the federally registered LEGO copyrighted design. The officers provided samples to CBP import specialists who recommended seizing the counterfeit sets. 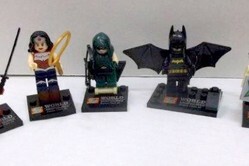 Counterfeit LEGO items are sold widely on e-commerce platforms and knock-offs are a particularly big problem for the company's minifigures, which have become hugely collectible in recent years. A blog post on eBay's website acknowledges that "not all items advertised as LEGO are true Lego brand products," pointing out that many manufacturers have started to sell products that are compatible with and compete with the branded product. "There are ways to tell if you are buying a true Lego brand product by the pictures and in some cases you can identify Lego brand figures that way," it continues. However, it notes that "there are times you must hold the product to know if it is truly a Lego brand product, so make certain you have read the return policy before purchase."